My Official kick off for the holiday season!! This is my favorite time of the year to bake and cook just because this is one season people eat food without counting calories(that is what I think atleast). So this year I started it off with these wonderful cookies I happened to see pictures of on pintrest..These taste as good as they look. Give it a try and a very Happy Holidays!! 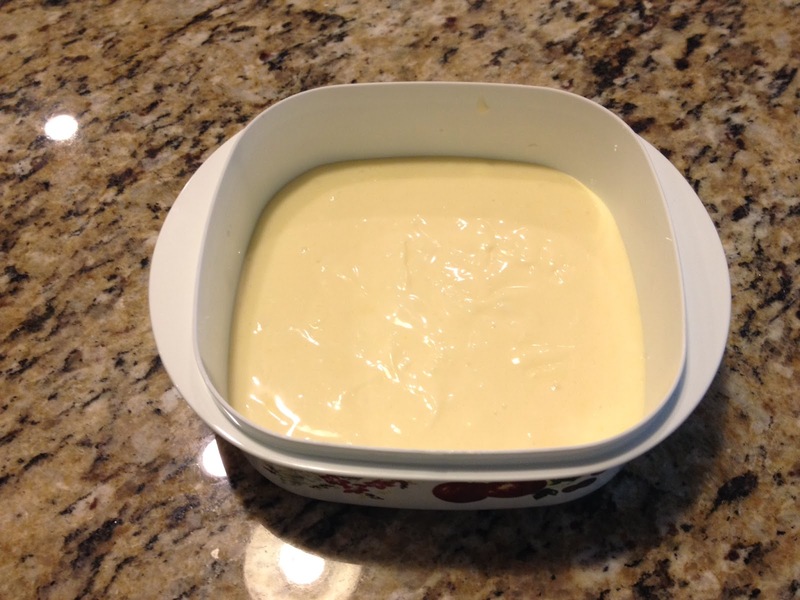 In a mixing bowl, beat cream cheese until light and fluffy. Beat in sugar and salt until smooth. Beat in egg yolk, sour cream and vanilla extract. Cover the bowl and place in the refrigerator for 30 minutes. In another large mixing bowl, beat together butter, sugar until creamy and combined. 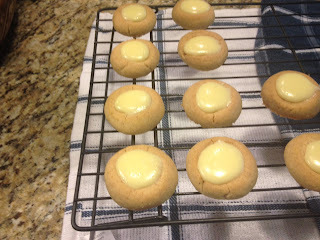 Mix in egg yolk and vanilla extract until incorporated. Now fold in the flour with a spatula into the sugar-butter mixture in batches until cookie batter is fully incorporated. 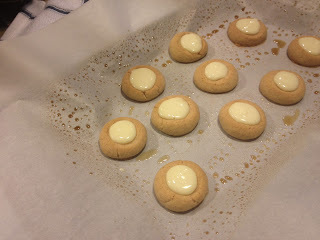 Line baking sheets with parchment paper and spray with non sticking spray. Take level tablespoons worth of the dough and roll into balls. 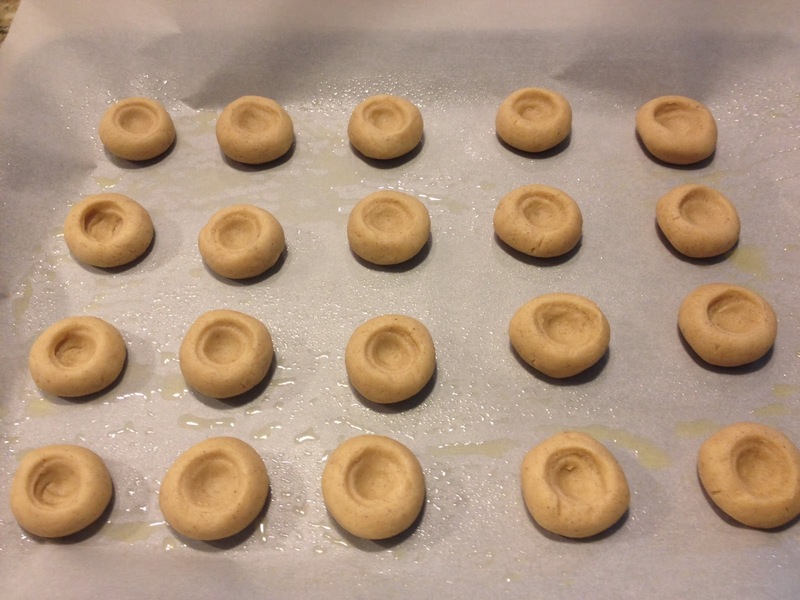 Place balls onto parchment-lined baking sheets. 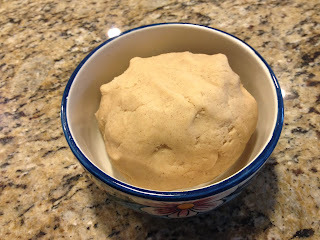 Using the thumb or handle end of a thick wooden spoon(I used reversed 1/4 teaspoon), lightly dipped in flour, make an indentation in the center of each ball. Place into the oven and bake for 10 minutes. Remove from the oven and carefully use your thumb (or the end of the same wooden spoon) to press the middle of the cookies back down to remake the indentations. 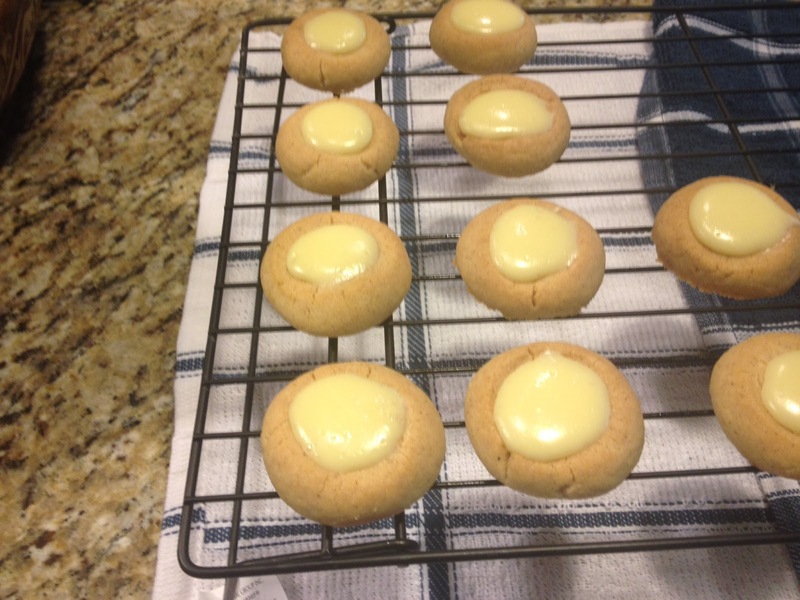 Put cookies back into the oven, rotating them from their original position, and continue to bake until slightly golden around the edges, about 8 minutes. 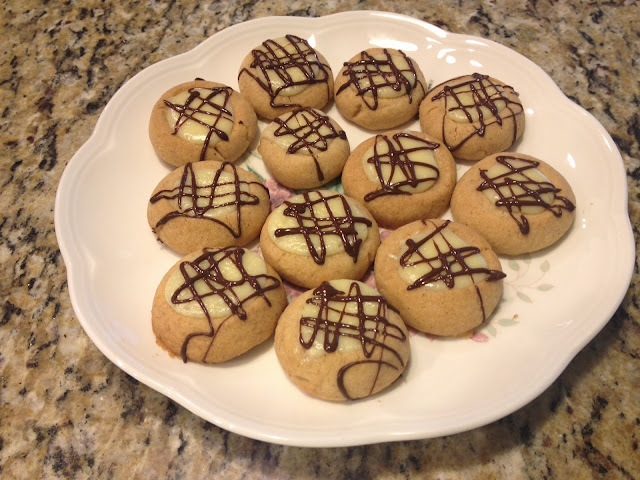 Remove cookies from the oven and fill the indentations with the cheesecake filling using a teaspoon. Place the cookies back into the oven and bake for 8 to 10 minutes. Remove from the oven and transfer cookies to a wire rack to cool off completely. Take the chocolate and chop up into almond sized pieces as shown in the picture. Add half the chocolate and half the oil to a microwave safe bowl. Now melt the chocolate in the microwave for about 1 minute and stir the chocolate with a rubber spatula every 20 seconds. It might take from 1 to 1 1/2 minutes depending on the power of the microwave. So it is very important to stir the chocolate every 20 seconds and melt till the chocolate is smooth, shiny, and completely melted. Check the instructions below for melting the chocolate in a microwave. Once the chocolate is melted pour it into a smaller(and deeper) bowl. 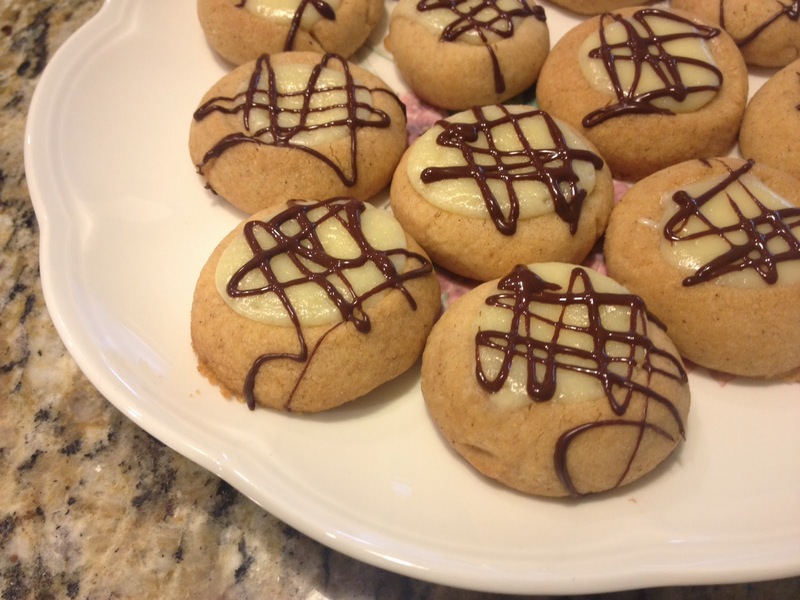 Add melted chocolate to a piping bag fitted with a small tip or a ziplock bag with the corner cut off and drizzle over the cookies. When cool, place cookies into the refrigerator to chill before serving.